At Least 5 Reportedly Killed As Strong Storms, Including Tornadoes, Hit Southeast : The Two-Way Four children were critically wounded in Alabama by a tornado and severe thunderstorms, the National Weather Service says. Tornadoes were also reported in Tennessee, Mississippi and Louisiana. 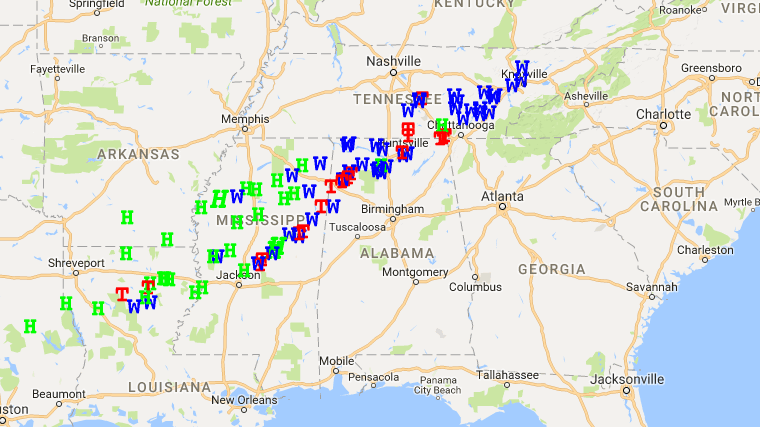 A map from the National Weather Service shows tornado reports (red T), wind reports (blue W) and hail reports (green H) for Tuesday. More than 20 tornadoes were reported as a powerful storm system moved through the Southeast. Zoom in on the map here. Severe thunderstorms in the Southeast on Tuesday night and Wednesday morning brought tornadoes, hail and wind damage, killing at least five people, according to the National Weather Service and media reports. The storms in Louisiana, Mississippi, Alabama and Tennessee come during an extreme drought in the region, which has fueled devastating wildfires in Tennessee and other states. As the storm system was brewing, The Associated Press reported that according to predictions, the rains might help suppress the wildfires but won't be enough to end the drought. In Alabama, at least half a dozen tornadoes were spotted and reported to the NWS in Huntsville. One tornado killed three people in the northern Alabama town of Rosalie, the NWS says, and The Associated Press reports that all three were in the same mobile home when the storm hit. A fourth person in the home was injured, the AP reports, citing the local chief deputy. Another tornado "completely destroyed" a 24-hour daycare in DeKalb County, Ala., leaving four children critically injured, the NWS says. In Tennessee, husband and wife died, possibly due to a tornado, as the storm hit their house in Polk County, the AP reports. A tornado was spotted in Coffee County, and the NWS noted wind damage in more than two dozen locations. In Athens, Tenn., the local newspaper was sharing information Tuesday about how to send help to residents of Gatlinburg as they recover from the fires that have destroyed the town. But on Wednesday, The Daily Post-Athenian was in trouble of its own. Fires Continue To Burn Across Southeastern U.S.
"The Daily Post-Athenian's office on Jackson Street was heavily damaged by the tornado which struck McMinn County this morning," the newspaper wrote on Facebook. The office would be closed — but, they said, "we will attempt to publish a newspaper today." Half a dozen tornadoes were reported in Mississippi, including one that destroyed four homes. And the storms brought hail, including hailstones as large as a baseball. Louisiana also saw multiple tornado reports and golf ball-sized hail in some regions. A tornado watch was still in effect for parts of Georgia, Alabama and Tennessee until 11 a.m. ET, the National Weather Service says.